We feel that Moab is the best place to enjoy our hobby, it offers mild to wild trails in difficulty, and every trail is surrounded by beautiful scenery only available in Moab. 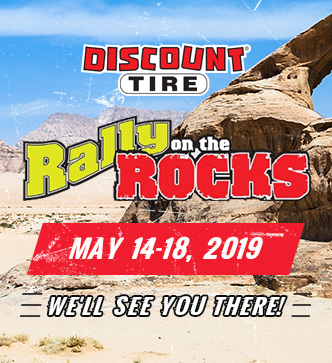 Discount Tire Rally on the Rocks is now the second biggest economic event in Moab UT, behind Jeep Safari. That means that the top two events in Moab are offroad/motorized events. Lets please be respectful to the residents of the town of Moab and obey all rules and be courteous at all times. Off-road vehicles can be hazardous to operate and are not intended for on-road use. Driver must be at least 16 years old with a valid driver’s license to operate. All riders should always wear helmets, eye protection, and protective clothing. Always use seat belts and cab nets or doors (as equipped). Never engage in stunt driving, and avoid excessive speeds and sharp turns. Riding and alcohol/drugs don’t mix. Children under eight-years old age are not allowed to operate any OHV on public lands, roads or trails in Utah. • All riders eight through 15 years old must possess an Education Certificate issued or recognized by Utah State Parks. • Operators 16 and older may drive OHVs, if they have either a valid driver’s license or an OHV Education Certificate. • Helmets are encouraged for everyone and are required for those under 18. • “Protect Your Privilege, Stay on the Trail.” Always ride in control and within your abilities. NEVER drink and ride! Refunds are at the sole discretion of Discount Tire ROTR. Website pages are printable. Please print off the schedule of events from the website for trail departure times and other activities. We have a ZERO tollarance for alcohol out on the trails. Never, ever drink and ride. Alcohol and SXS’s don’t mix, but create a deadly and illegal combination. Some trails leave directly from the arena and others need to be trailered to. Please review the trail descriptions and ratings carefully, as your safety is our number 1 concern, followed directly by having FUN. We strive to have capable trail guides to help you navigate obstacles, but they are limited by your driver experience and machine capabilities. All trails have minumum and maximum participants, Discount Tire ROTR reserves the right at their sole discretion to cancel scheduled trails. If that happens, we will do our best to substitute trails of equal difficulty.